Coat, Top & Necklace : ZARA. Fur Collar : ASOS. Earrings & Skirt : Topshop. Umbrella : Accessorise. I'd been accumulating various bits and pieces over the last month or so that I hadn't got around to styling into an outfit. My little collection included; a beautiful pink coat, a blouse with a leather collar (purchased in a Parisian Zara which somehow makes it even more exciting), an incredibly OTT necklace and some equally extravagant green earrings. They'd all been sitting around being admired but going unworn So, on the 5th day of London Fashion Week I just decided to chuck them (couldn't think of a more elegant word than 'chuck') all on at once. Voila. As it turns out, it's by far one of my favourite outfits, ever. It's just the perfect mixture of everything that I love. 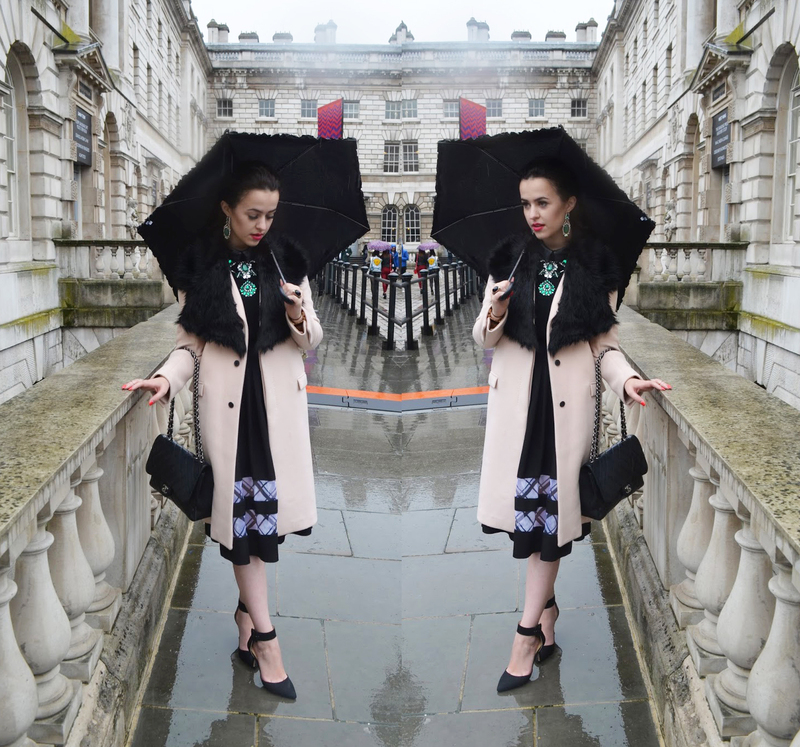 Pink, emerald green, obnoxiously large jewels, fur (faux, of course) leather, collars, midi skirts, checks AND to top it all off, my favourite weather; rain. My friend Bianca and I truly had to battle with the elements to capture these photos - we were well and truly sodden by the time we reached the new american fast food chain 'Shake Shack' in Covent Garden where we'd planned to have a late lunch. I think it's safe to say that we were slightly overdressed for the occasion. This is so perfect, I bet you were getting stopped for photos all day! wow you look amazing! Love everything about this outfit! you look absolutely charming! everything about this outfit, a massive thumb ups. hope your third year in uni go well! gorgeous outfit, you look amazing as always! You always have such lovely outfits! I love this one too! You always look so elegant. I've got my eye on that skirt! Love the emerald jewellery, on paper they would seem like too much worn together but they actually look lovely on you!